Superman was born on the planet Krypton and sent to Earth by his parents in order to survive its destruction. Landing in the Midwestern US, he was then adopted by a couple in a humble farming community, who named him Clark Kent, taught him to conceal his true identity, and only use his powers for good. Imbued with incomprehensible strength, he has charmed readers and viewers alike in his many appearance. 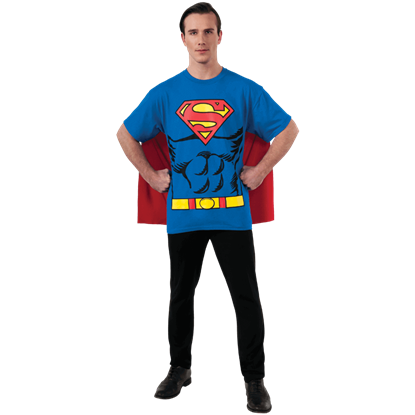 Superheroes Direct offers collectibles and apparel sure to please any fan of Superman. Our t-shirts, hoodies, and other apparel feature the iconic Superman logo, as well as graphics pulled from the comics and films. Superman keychains, drinkware, home decor, statues, POP figures, and more all make perfect collectibles to add to any Man of Steel collection. 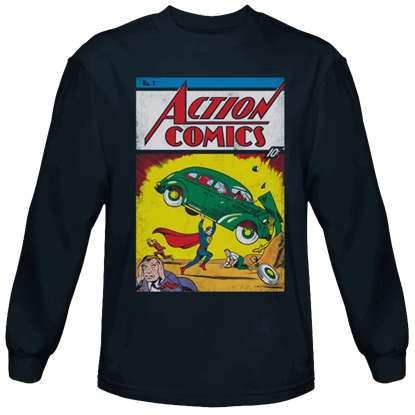 Displaying a piece of comic book history, the Action Comics Issue 1 Long Sleeved T-Shirt features an image of Superman wearing his classic attire and sprinting with a car high above his head, near the scene of a spectacular explosion. 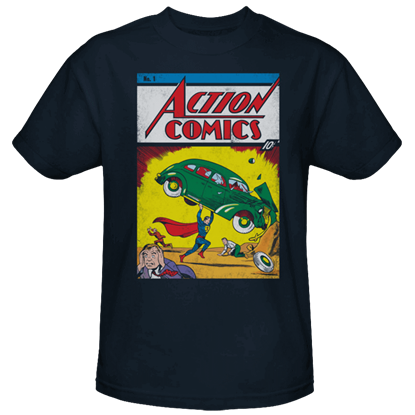 A must have for any comic fan, the Action Comics Issue 1 T-Shirt features an image from the comic which ushered in the Golden Age of Comics, in which Superman is shown running amidst a scene of chaos with a car held above his head. Action Comics 23 is where the greatest enemy of Superman, Lex Luthor, first makes an appearance. 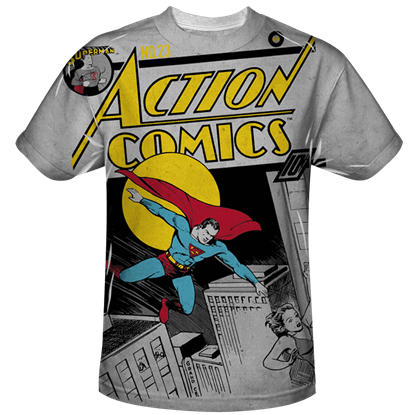 Display your knowledge and love of this amazing comic book with the incredible design of the Action Comics Issue 23 Bold T-Shirt. Underneath his unassuming exterior, Clark Kent is secretly ready to defend the Earth any time as his true Kryptonian identity, Superman. 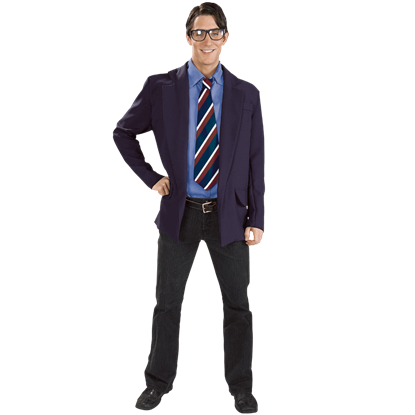 Get this fun transformation look when you wear the Adult Clark Kent Superman Costume. 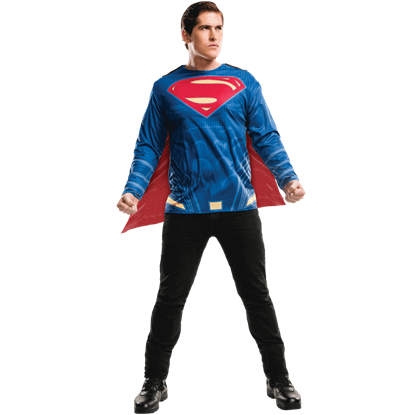 The strategically placed padding of the Adult Dawn of Justice Deluxe Superman Costume Set makes it easy to achieve the superhuman physique of this superhero sent to Earth from Krypton. This set also includes a detachable red cape. 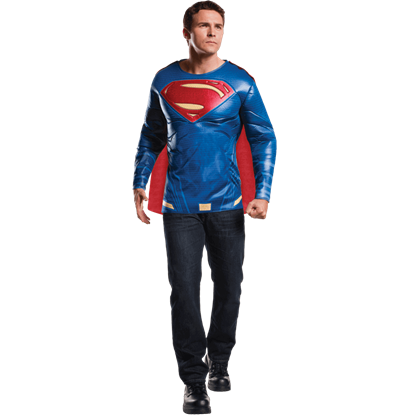 Wear the super suit of the marvelous Man of Steel with the comfort of a long sleeve shirt when you don the Adult Dawn of Justice Superman Costume Top. This officially licensed superhero shirt includes a fun, removable red cape. One of the most powerful characters of the DC Universe, Superman is one tough hero. But in Dawn of Justice, he may have met his match. 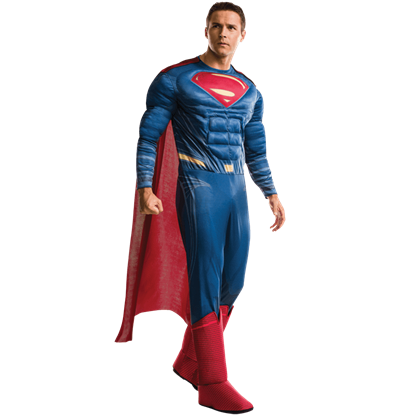 Get his modern look from this film when you wear the Adult Deluxe Dawn of Justice Superman Costume. Billowing behind him as he flies through the skies, Superman is rarely seen without his long red cape. 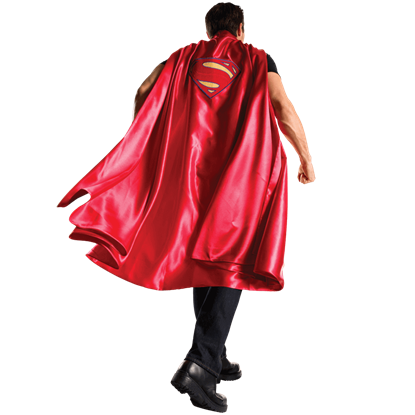 Add this essential detail to your heroic costumes with the Deluxe Adult Superman Cape, full length and made of high quality fabric. Not all heroes have superhuman muscles and capes, but these details sure make for a stand-out costume. 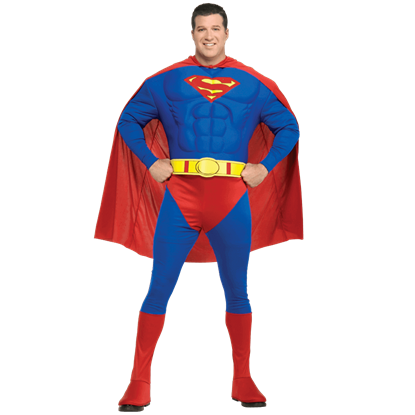 The Adult Plus Size Deluxe Superman Costume lets you take on the superhero stylings of the classic Kryptonian defender of Earth. 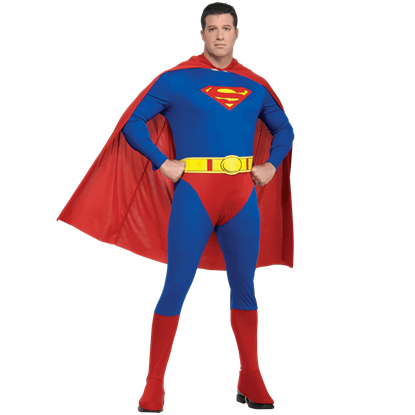 Anyone can be a hero, and the Adult Plus Size Superman Costume is a great way to dress the part. Transform yourself into the iconic Man of Steel when you wear this cape and jumpsuit set inspired by Supermans classic comic book look. Withstanding the test of time, Superman is one of the most iconic comic book heroes around. 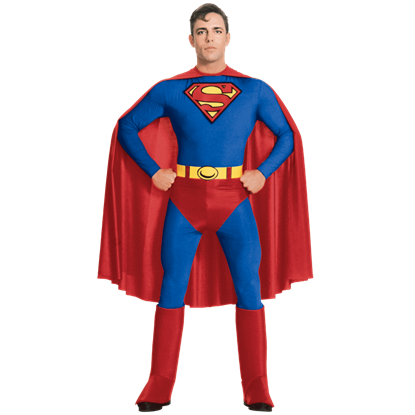 Now you too can don his classic heroic garb for your next superhero-themed outing or costume party when you wear the Adult Superman Costume.